Eligibility Criteria: Open to patients with a Prolia® prescription and commercial insurance for Prolia®. Patients may not seek reimbursement for value received from the Prolia® Co-pay Program from any third-party payers, including a flexible spending account or healthcare savings account. This program is not open to uninsured patients or patients receiving prescription reimbursement under any federal, state, or government-funded healthcare program, such as Medicare, Medicare Advantage, Medicare Part D, Medicaid, Medigap, Veterans Affairs (VA), the Department of Defense (DoD), or TRICARE, or where prohibited by law. If at any time patients begin receiving prescription drug coverage under any such federal, state, or government-funded healthcare program, patients will no longer be able to use this card and you must call the Prolia® Co-pay Program at 1-844-369-9962 (9:00 am- 8:00 pm EST, Monday-Friday) to stop participation. Restrictions may apply. Amgen reserves the right to revise or terminate this program, in whole or in part, without any notice at any time. This is not health insurance. Program invalid where otherwise prohibited by law. From here, you can register your Prolia® Co-pay Card, sign in to view and manage your patient profile, or re-enroll in the Prolia® Co-pay Program. Program in just 4 steps. Card now by registering here. 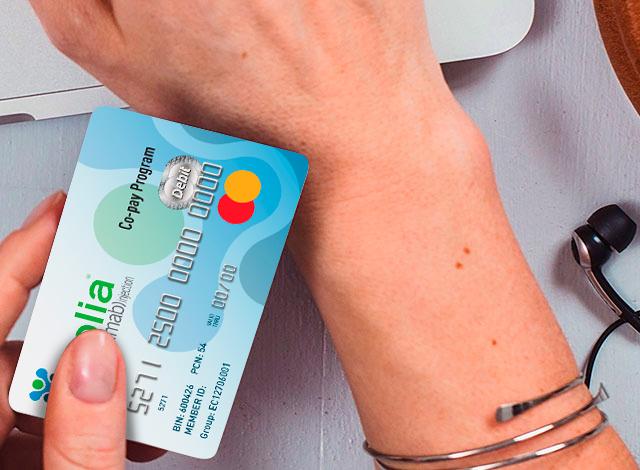 If you've already registered, sign in to manage your Prolia® Co-pay Card. First time signing in? Call (844)-369-9962 to get a temporary password. After you receive your re-enrollment letter, reconfirm your eligibility every December. Take the next step here.